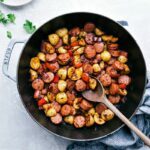 The easiest 20-minute sausage and potatoes skillet meal! 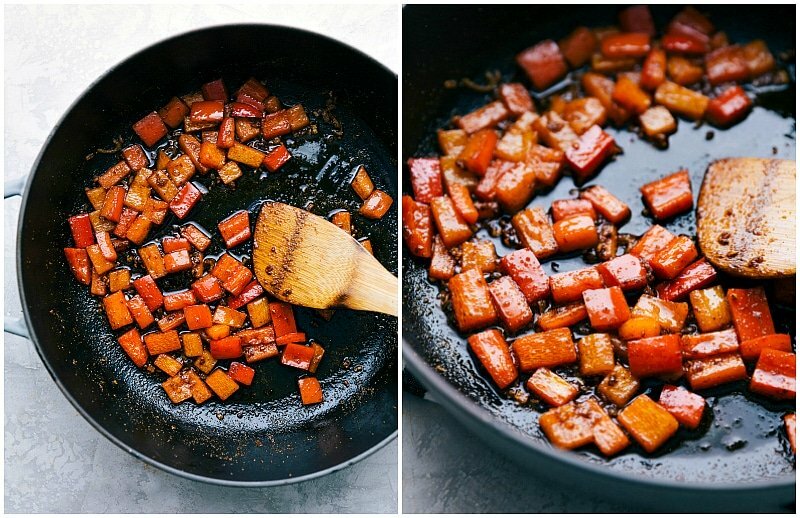 This simple dinner can all be made in one skillet and is loaded with flavor! Pair this dinner with a simple side salad such as this cucumber salad, strawberry salad, or an easy appetizer such as bruschetta. 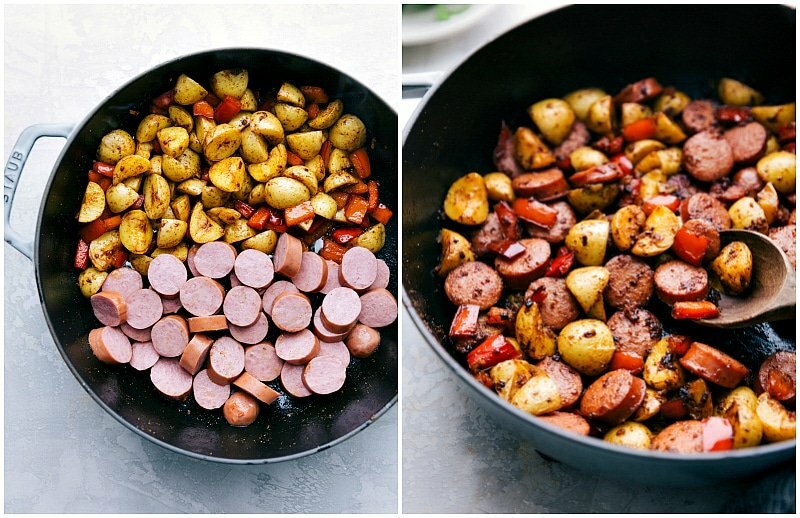 Potatoes and sausage in 20 minutes? Say it’s not so. But no gimmicks here. You really can have this delicious, easy, and healthy-ish dinner on the table in 20 minutes or less! Today our one skillet dish starts with microwaving baby gold potatoes until tender. They’ll later get crisped up and delicious in the skillet with herbs, olive oil, and a little bit of butter. We’re also using smoked sausage, so all it really needs is to be warmed through in the skillet. And meanwhile, it’s being infused with plenty of flavor thanks to the spices. I like using turkey sausage because it keeps this dish on the healthier side, but any smoked sausage and you’ll be in business for a 20-minute meal time. Microwave baby potatoes: the smaller your baby yukon golds are, the quicker this will go. Typically 5-7 minutes and your potatoes will be ready! Prep ingredients: while the potatoes are microwaving, chop the shallot and red pepper. And no judgement for jarred garlic here, because, well, 20 minutes is priority right now. Cook: in goes shallot and garlic first. Next is red pepper. And while the red pepper is cooking, you can chop up the tender potatoes to get crispy in the skillet. Potatoes are in now and finally, sausage. Sauce: while everything is finishing cooking, you can whip up a creamy dijon sauce if you’re someone that needs a creamy element. The sauce is only 3 ingredients so it goes quick. It’s also totally optional; my family loves this meal with and without the sauce. I mentioned the dijon sauce which goes well with the sausage and potatoes, but another great topping: parmesan cheese. Freshly grated with a microplane is the best! While we love and I highly recommend the baby gold potatoes, baby reds will work here as well. The shallot delivers a bit more of a sweet and mild flavor, but a yellow onion will also work in its place. Any sweet bell pepper or even a green bell pepper will work well in this dish. 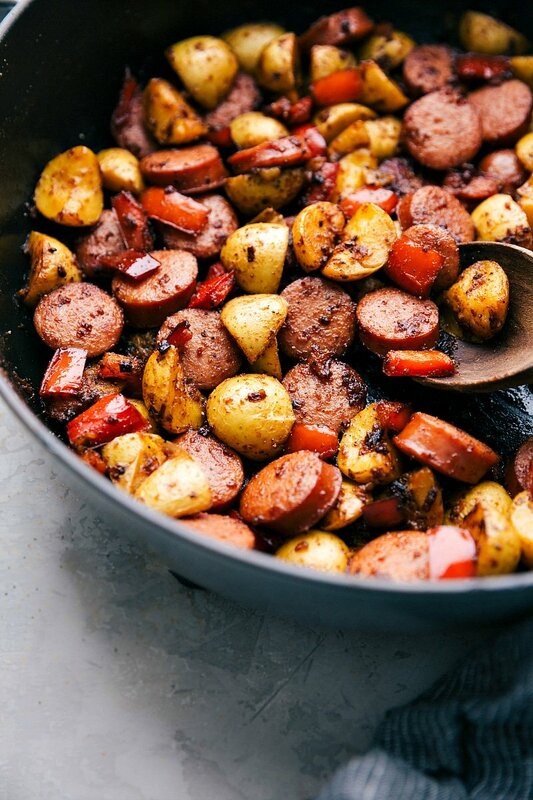 Try an herb-y sauce in place of the dijon sauce topping this sausage and potatoes skillet. The sauce on this chimichurri chicken would be delicious! Don’t want to use the microwave? 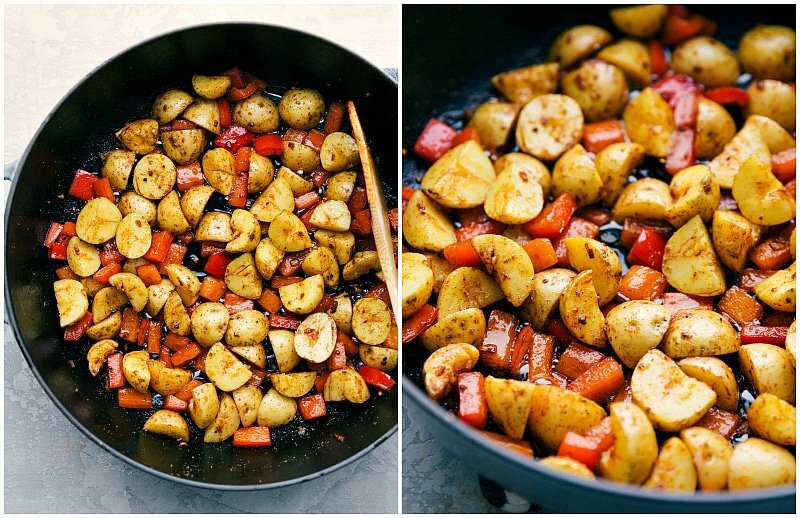 You can parboil your potatoes instead; it will just increase prep time! The intensity and quality of spices varies from brand to brand. 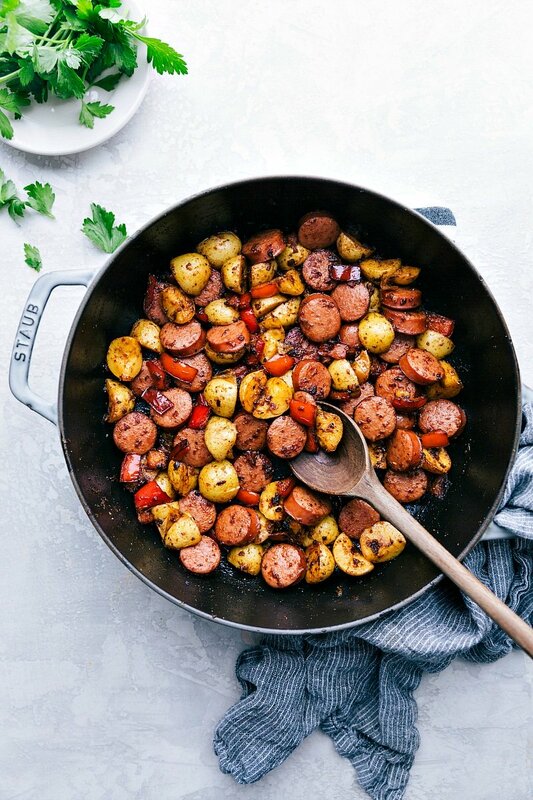 I recommend good quality spices for this sausage and potatoes skillet meal. Depending on the spices you have, you may need to increase the amount. I love, love roasted california garlic powder it adds so much to this meal. This is a private selection brand from Kroger stores (not sponsored, just a fan!) Or course any garlic powder works, but make sure to give this dish a taste and increase if needed. With so few spices and ingredients, the ingredients you use matter. 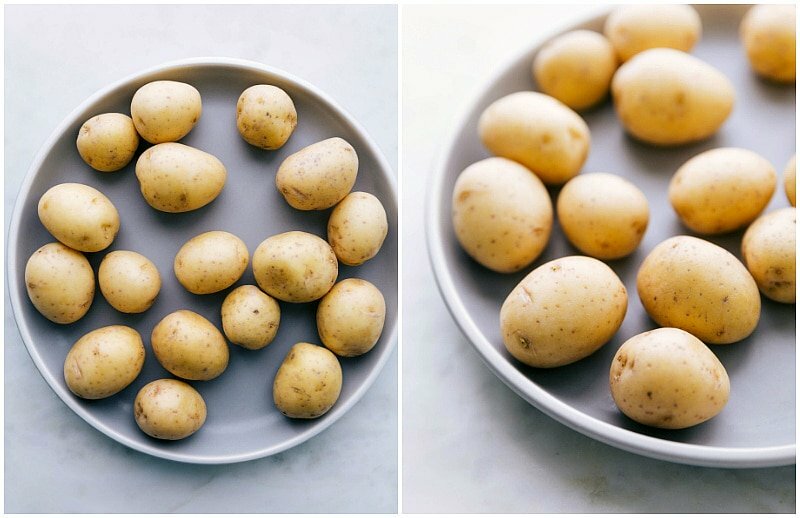 Place potatoes in a single layer on a large microwave safe plate. Microwave on high power for 2 minutes. Flip potatoes over and continue to microwave for about 2-3 minutes longer (if the potatoes aren't really small they'll take a couple minutes longer; pierce each potato once with a fork if needed). The potatoes should be tender. Let cool slightly then cut in half then half again to get quarters. While potatoes are cooling, finely chop the shallot and chop the red pepper. Add 1 tablespoon oil and 1 tablespoon butter to a large heavy bottomed pot (12 inches or larger). Heat to medium heat. As soon as the butter is nearly melted, add in the shallot. Stir for 1 minute and add in the garlic and stir for about 20-30 seconds. Lower heat if either are cooking too quickly. Add in the remaining 1 tablespoon olive oil, paprika, garlic powder, onion powder, and chopped red pepper. Cook, stirring occasionally with a wooden spoon for 3-4 minutes. Meanwhile, slice the sausage into coins on the diagonal and slice the now slightly cooled potatoes in quarters. Push the red pepper to the side and add the remaining 1 tablespoon butter and the potatoes. Cook for 2-3 minutes to crisp up the potato and get flavor on it. Serve with freshly chopped parsley and sauce (Note 1) if desired. This sounds yummy! How would you prepare the potatoes if you didn’t want to soften in the microwave first? 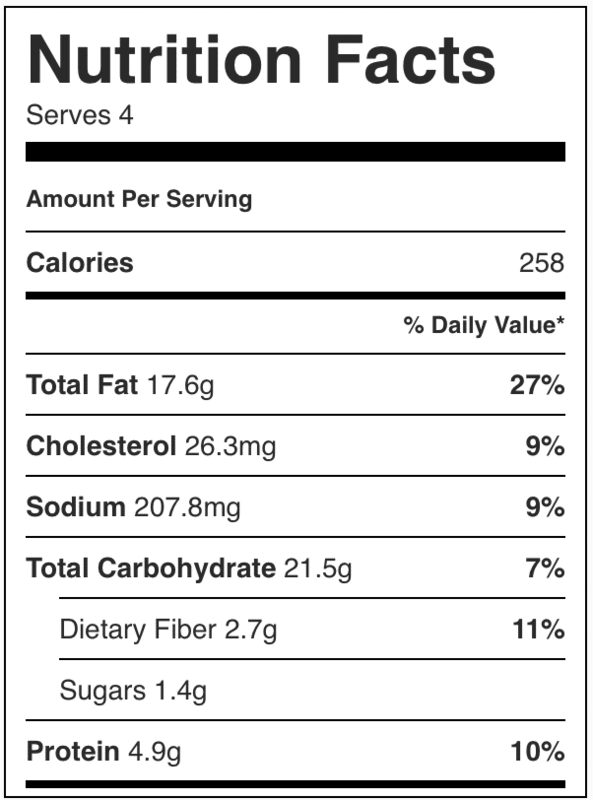 Also, if you wanted to add corn as well when would you do that? If you don’t want to use the microwave, I’d recommend parboiling the potatoes! 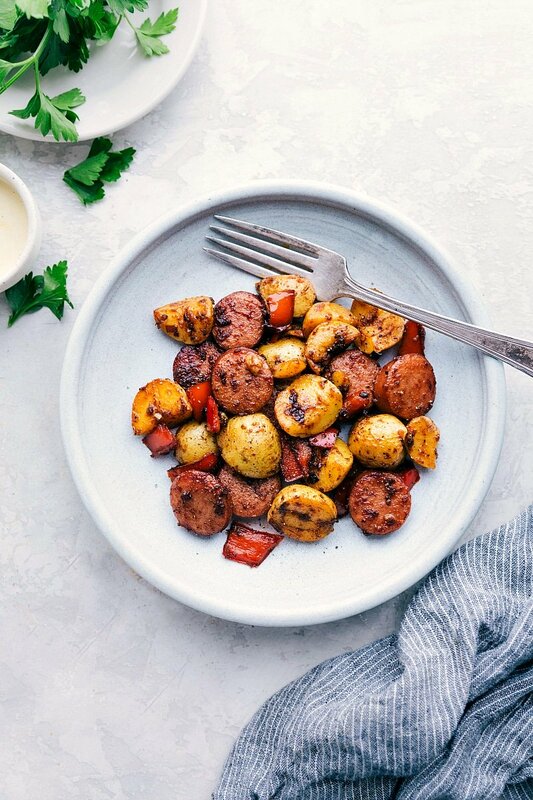 (https://www.leaf.tv/articles/how-to-parboil-potatoes/) Hope you love this dish!